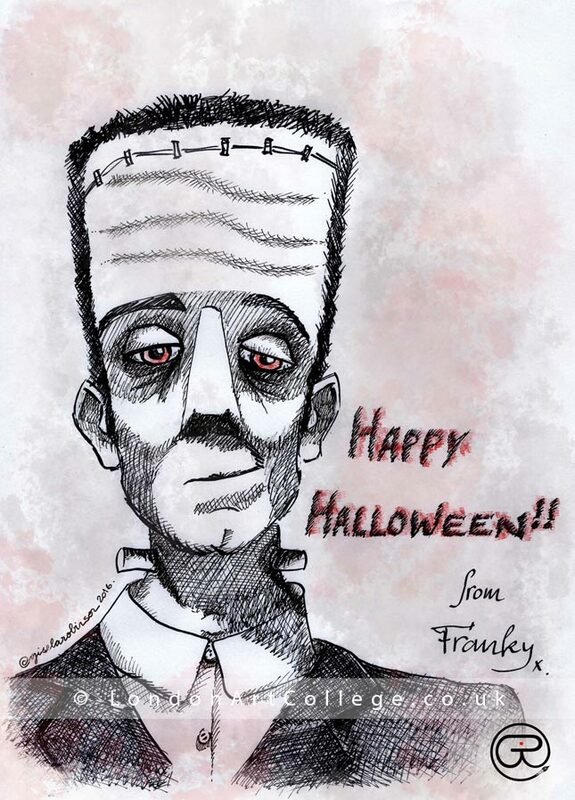 Happy Halloween to all of our London Art College students and readers of our College News blog! 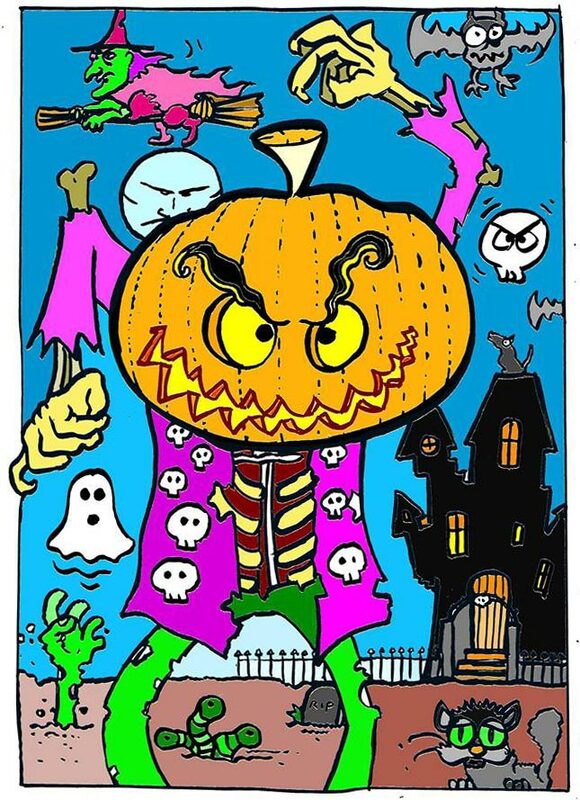 Here is a collection of some amazing Halloween inspired pieces of artwork from our students. 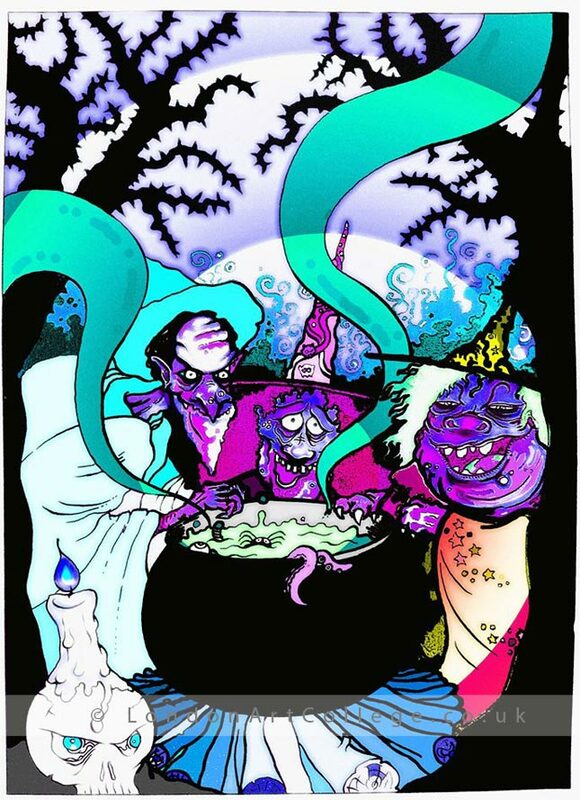 We hope you enjoy them….Don’t get too scared…!! 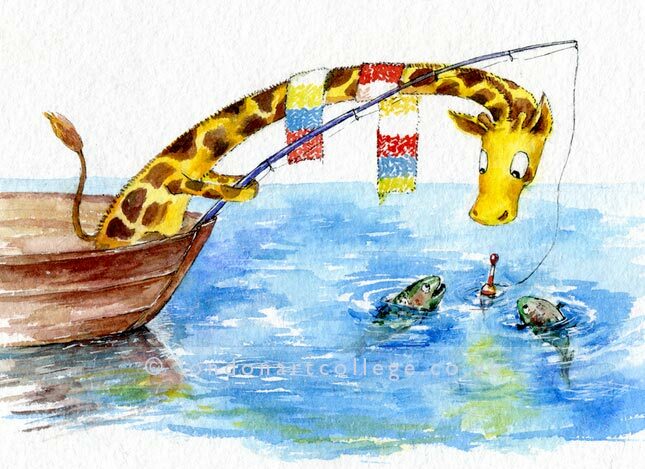 This is a wonderful illustration by Rachael Chattelle who is currently studying the Illustrating Children’s online Art Diploma Course. 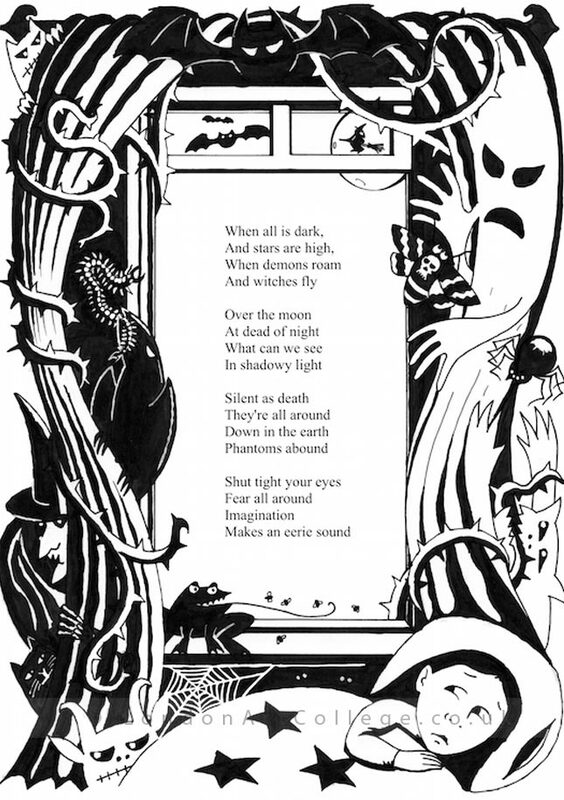 Rachael created this image as one of her exercises in the course illustrating the poem ‘When all is Dark’. 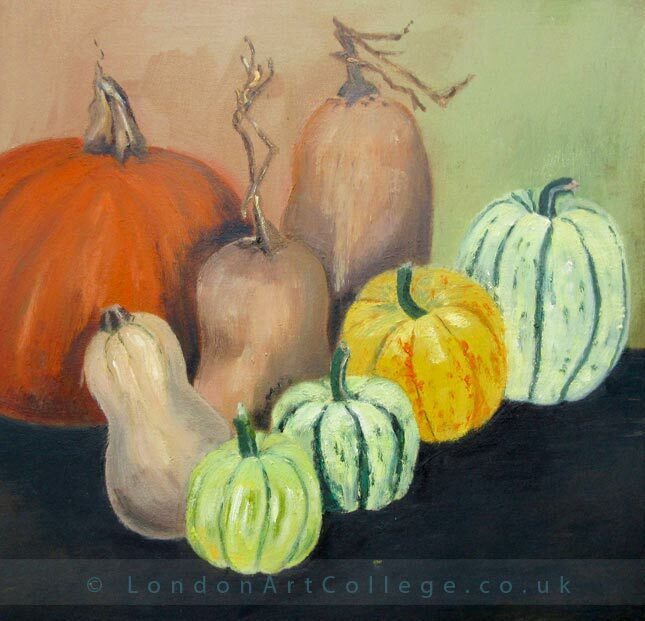 And finally Pam Cherry created this fantastic painting of pumpkins and squash while studying on the Still Life course. 1. Stop procrastinating and start scribbling! Before I start any project I have a fear that I’m not going to come up with anything at all. I find excuses not to start. This brief was no exception. I don’t think this fear will ever go away — important is to start! 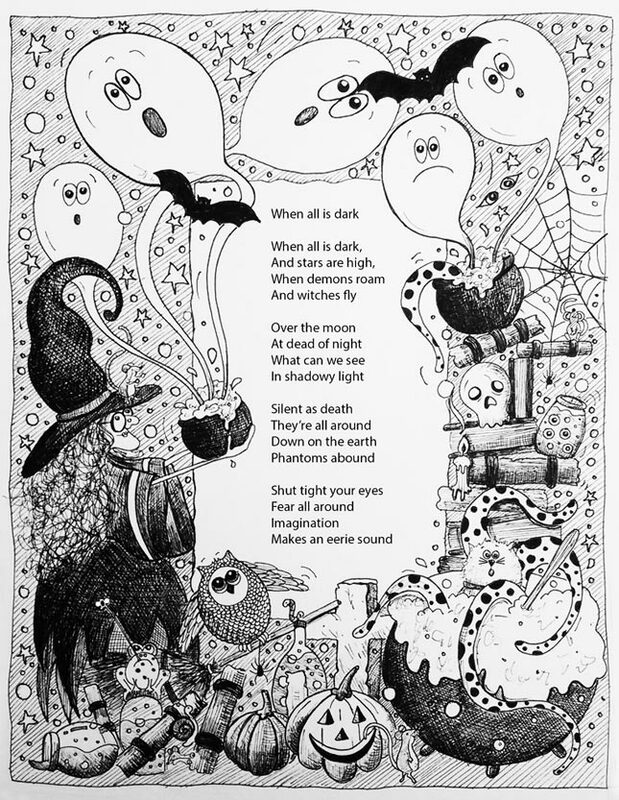 To get this assignment kicked off, I studied scary stories and watched scary TV, scribbling down ideas as they came to me. Don’t write them down later — write them down now! To this end I have an old clipboard loaded with copier paper to keep notes and drawings — loose sheets make it easier to use anything good later. I carry on till my scribbles start to cohere, and I’m itching to get on! 2. Follow the brief and find a story. I now have a harder think about the Brief. 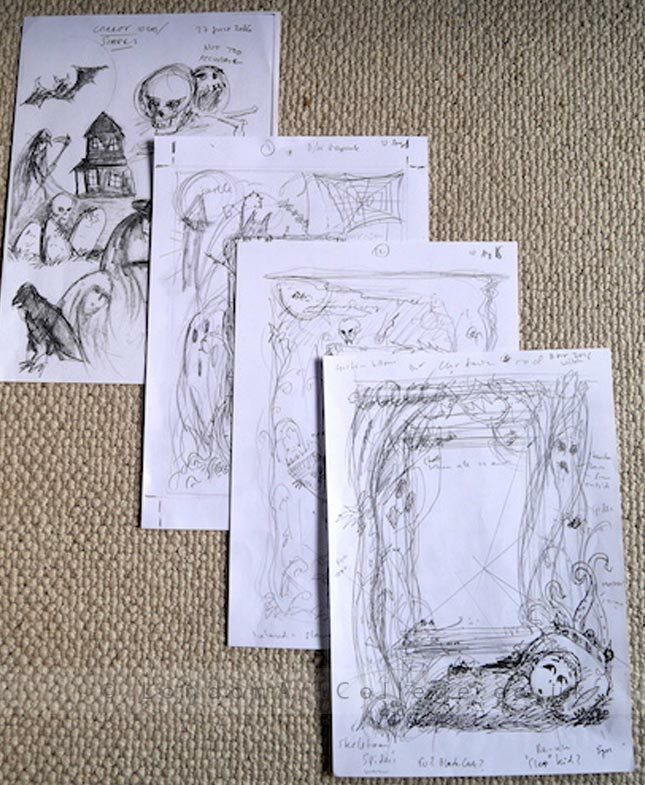 In this particular case, a great big hole in the middle for text, black and white, and creepy — and I start sketches that conform to the brief, referring to my previous scribbles. I go through periods of frustration at this stage. When I realise, I stop — carrying on is counterproductive. I’ll take a step back to figure out what’s happened. Usually I’ve been trying something that isn’t working, over and over. Eventually a story starts to develop, and I home in on an idea. A couple more sketches, and again I’m itching to go on. 3. Figure out what to do, and do it! I now come up with a layout, using a light board, tracing paper and printer/copier to rearrange things till I’m happy, and end up with a line drawing. I make copies to try out shading / colour etc. What I have now will look bad compared to what’s in my head, and I will get a touch discouraged. Time for some more junk TV as I experiment! Once happy, what I do depends on the technique I’ve chosen. In my experience it’s risky to use something I’ve just bought and need to justify — say Japanese bamboo-bristled brushes. I ended up choosing ink (black and white), using brush and pen. I always remind myself anything can be fixed, nothing is wasted, and above all, to enjoy the creative process! 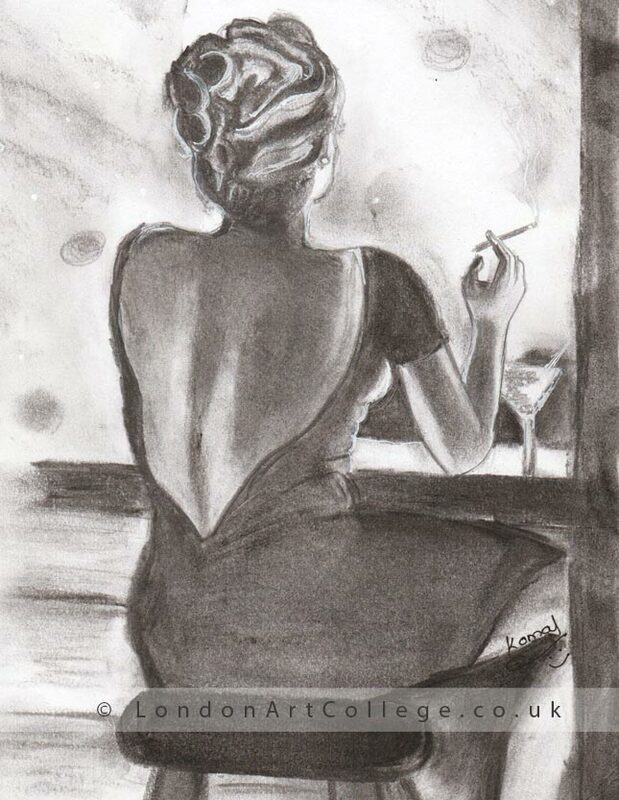 My name is Komal Pankhania and I am studying the Drawing and Painting Online Art Course with the London Art College. I have started this course for improving my overall techniques and the final output of the painting. 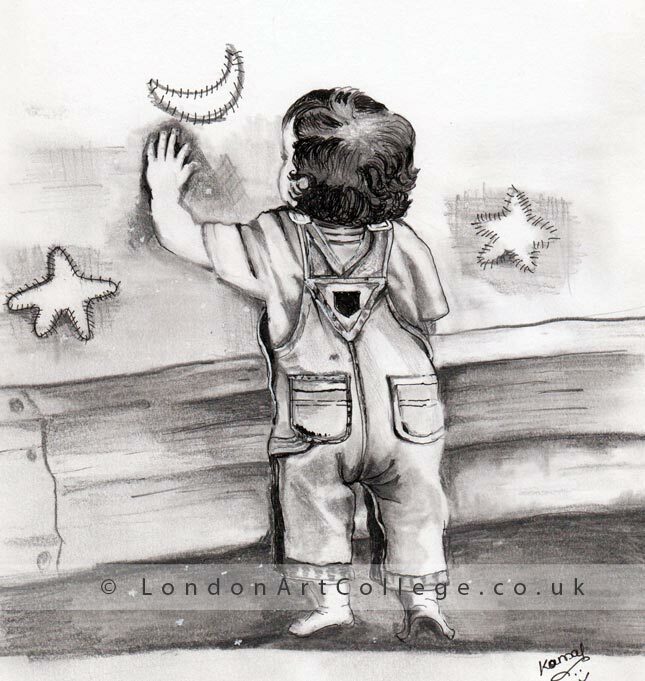 I have passion of drawing since childhood and has been drawing since then, but after getting married and having a toddler it was not possible for me too join some art college to give a finish to my passion, while searching for the online courses came through London Art College and enrolled immediately. The course content had everything I wanted to learn for the perfection. After Joining the course I can really see the difference in my work even my friends and love ones feel the change. I am able to get more commission work now. Thanks to my tutor Alan Dedman for guiding me. 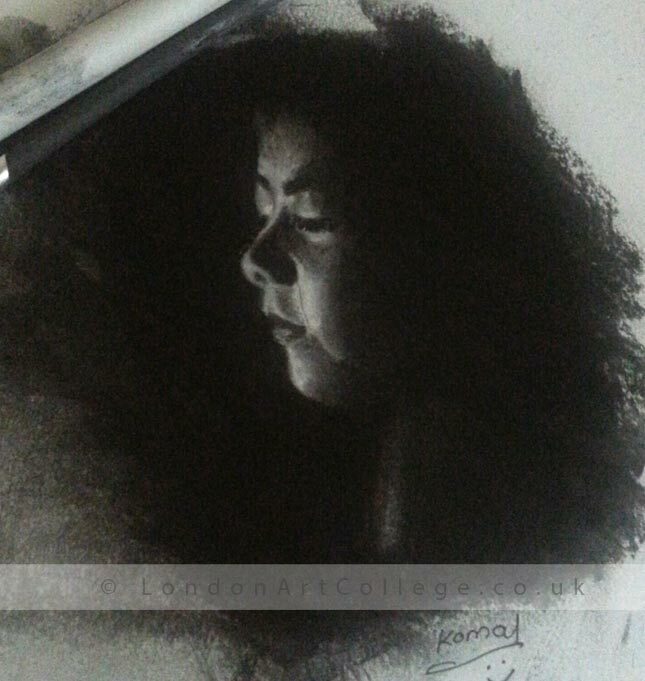 I love to work more with charcoal and pencil but now after knowing the right techniques I am able to work with almost all mediums and no more scared to experiment…the funny side is my daughter is repeating me and trying to use textures at the age of 4 and she is really good at it. I am really glad that I joined the course and able to do what I wanted still in the mid of the course really eager to know what will be the result after the completion of the course. 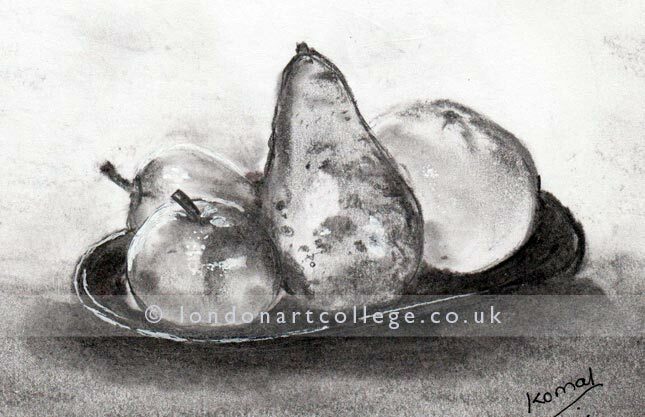 Once again I thanks my tutor Alan Dedman and London Art College for making online course. Tutor Monika Cilmi has written two new books which we hope will be of interest to her students. 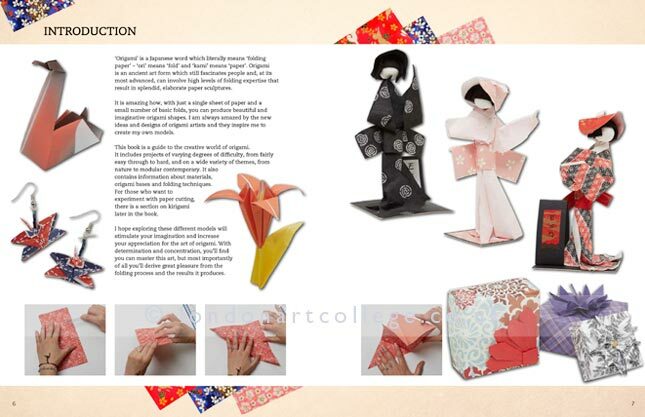 Her first book, entitled Origami, is available now and you can see some images from the book below. 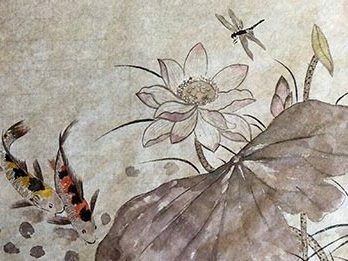 Monika’s second book ‘Chinese Brushwork for Beginners’ will be of great interest to Monika’s students who are studying on her Chinese Brush Painting Course. 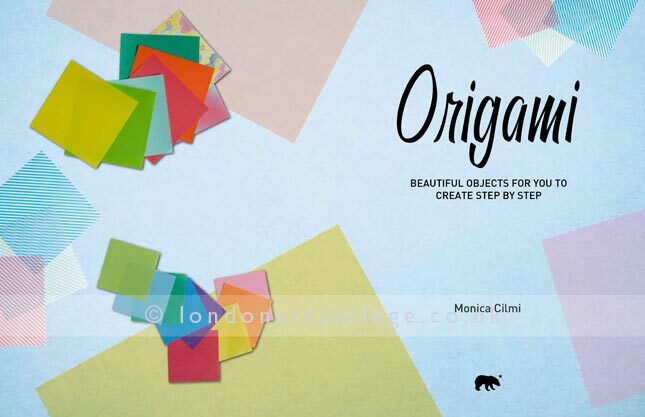 ‘Origami’ by Arcturus Publishing is out now and students can purchase it on Amazon now for a November delivery. ‘Chinese Brushwork for Beginners‘ is in the series of ”How to Draw and Paint” by Walter Foster publishing. Students can pre-order their copy on Amazon today and will be released in March 2017. 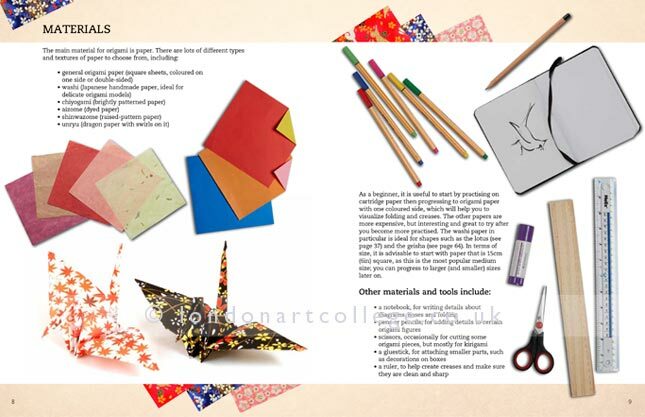 The Origami book is dedicated to my son. For me it represents a big change in my life and it is inspired by this new chapter and the passion for origami and Japanese art. My second book, Chinese Brushwork for Beginners, is more of an adventure, something I did not expect to write. It is aimed at the beginner who is interested in a very personal approach, by a western artist to inspire their imagination. 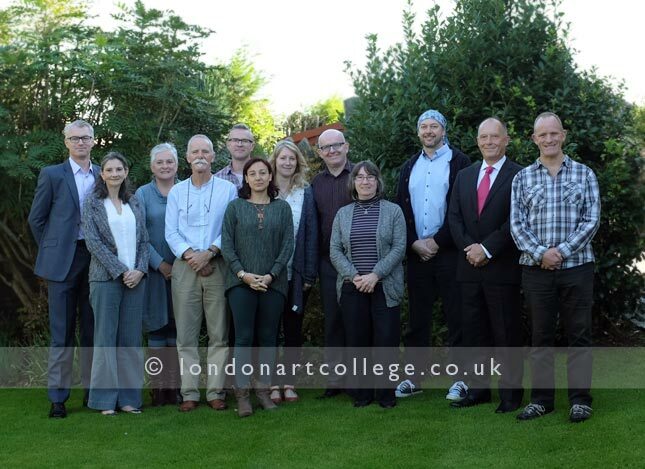 As many of our regular readers may know the London Art College tutors and admin staff recently had their annual general conference in Bristol UK. Whilst in attendance, each tutor was given hotel paper to write notes on throughout the meeting – which we all did. 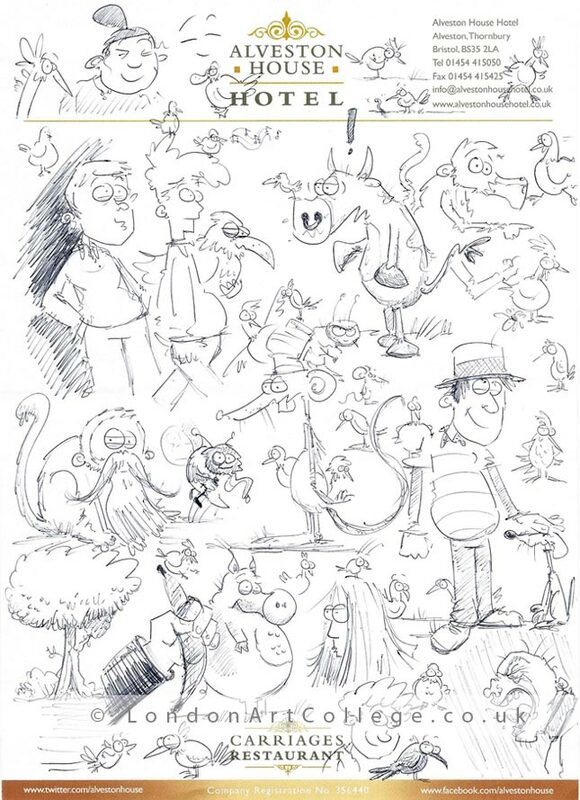 Tutor Spencer Hill not only took notes, but he also filled one of his pieces with some incredible cartoons and doodles! We absolutely love it and felt it was quite blog worthy! A definite source of inspiration for his Illustration Course students and students on the cartooning course. We hope you like it too! 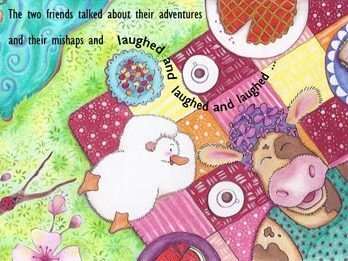 My name is Natalia Romankova and I am currently studying the Illustrating Children’s Book Online Art Diploma with Maggy Roberts. What great news! Thank you very much! My picture is called ‘A new friend’. 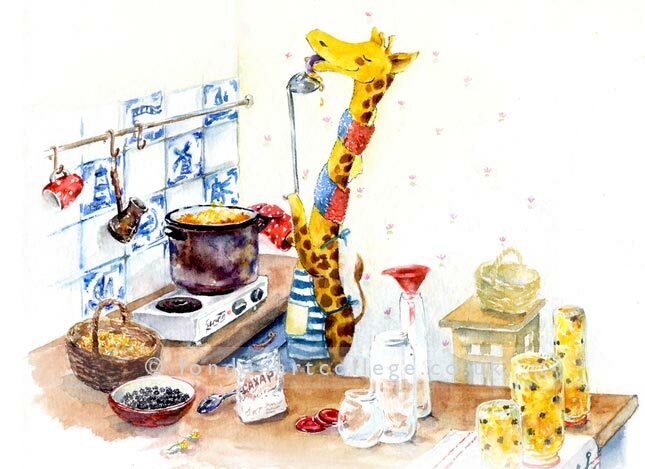 This is the recent one from a series of pictures about Vaska the giraffe. This character was born when I was doing exercises for my first course in London Art College – Illustrating Children Books. Gradually, he became the hero of many of my works. To the moment, I already have 12 published postcards depicting Vaska’s adventures. 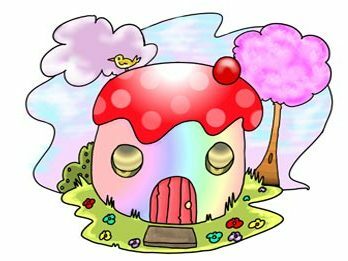 Vaska lives in a lighthouse at the seaside. He’s very creative, positive and he likes to try something new. 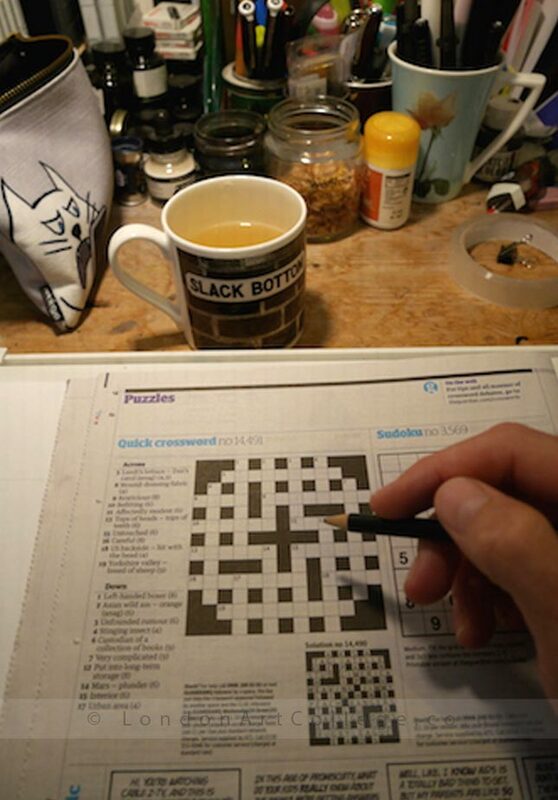 He is alone on the most of the pictures. I was thinking about a friend for him, but for a long time nothing came to my mind. Once I realized who is this friend and how they met. This is a small seagull living in a nest on the top of the lighthouse. Now they just have to become friends. I’ve enclosed below some of the pictures about Vaska’s adventures. 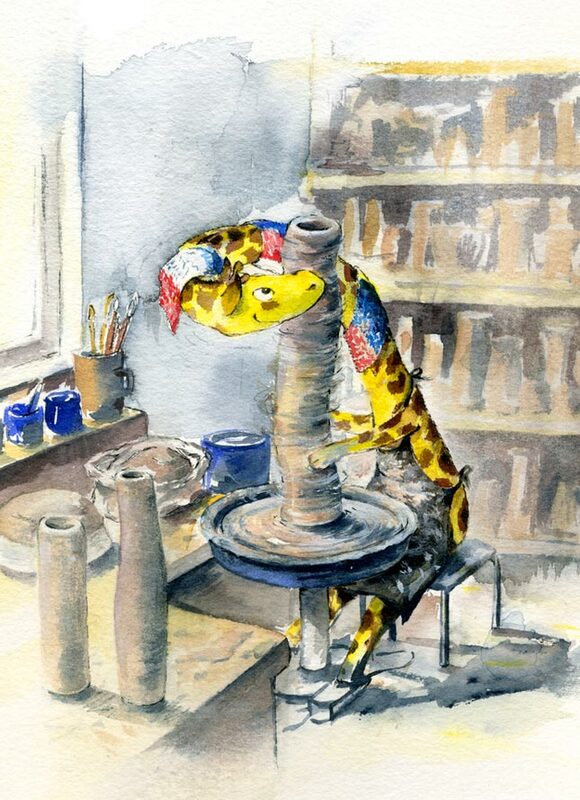 The work is done in watercolour. Some small details are emphasized with a black liner. The size is 36 x 48 cm. I also want to thank my teacher Maggy Roberts! 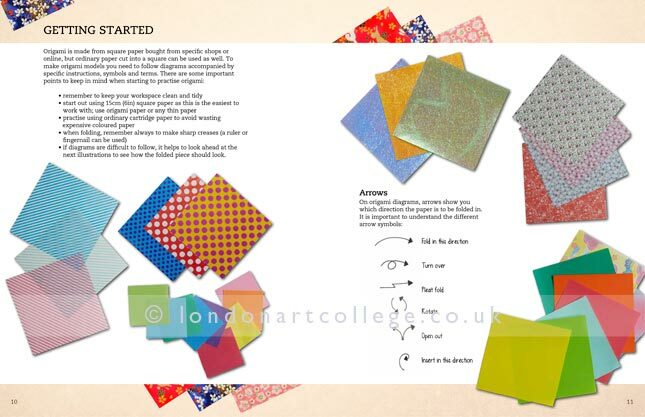 I feel that studying in London Art Collage changed a lot in my life. 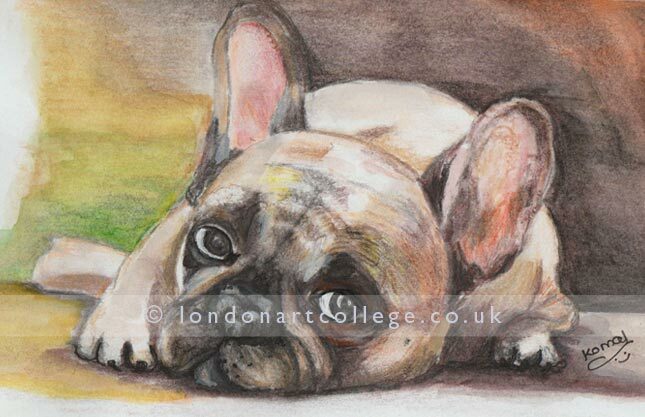 My name is Shuli Han Dulley and I am currently studying the Watercolour Online Art Diploma Course with tutor Jem Bowden. 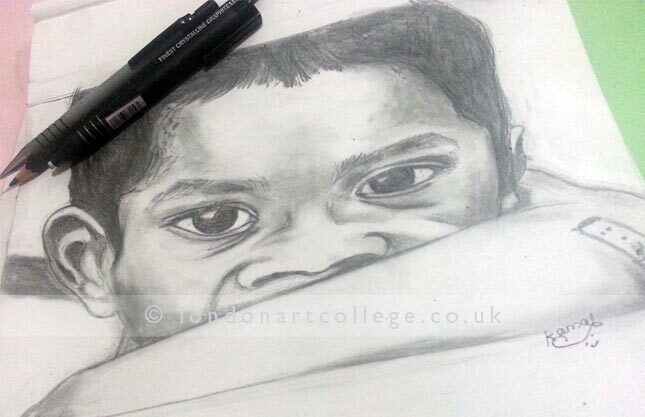 I would like to thank all of you in London Art College giving me the opportunity to show my art. I always enjoy doing botanical art, and I have been painting flowers and plants for a few years. The painting I put in to the competition (58 x 36cm) is one of them. It also including some Chinese elements, as I did Chinese painting when I was in China. 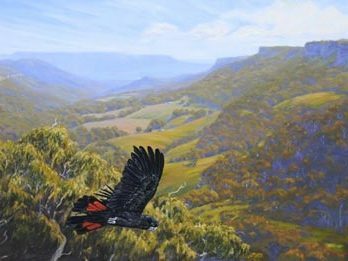 I also like to paint scenery, I need to loose up the way I paint for scenery. 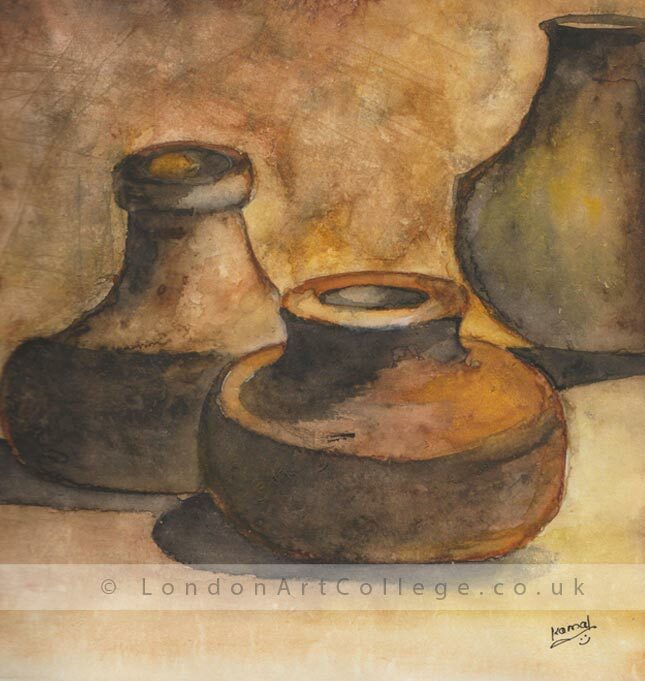 I joined London Art College hoping to get help to improve my scenery painting. 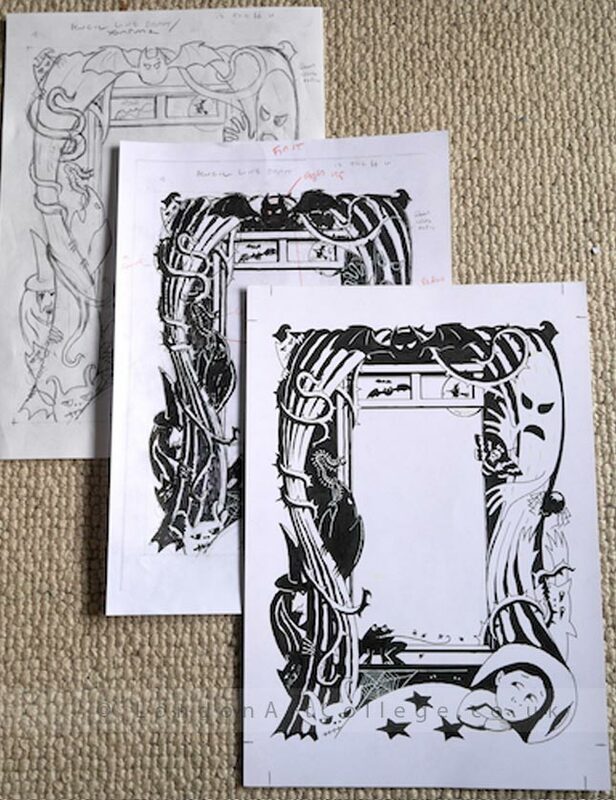 I also want to thank to my tutor Jem Bowden, he has given me a lot of advice for my assignments. I will try my best. 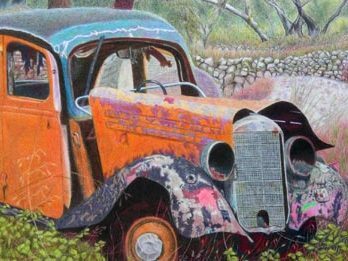 Why not get a Painters Online Free Gallery! 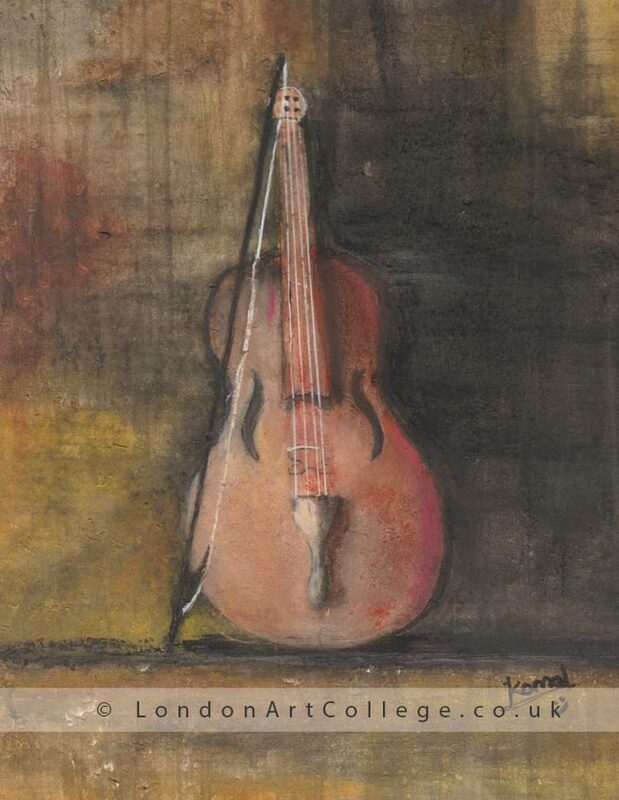 The London Art College have a good relationship with Painters Online and we thought it might be lovely for our students to know about the Painters Online Free Gallery. Did you know about their Free gallery service? Artists can add up to 4 paintings per day, with no limit on how many they keep in their portfolio. 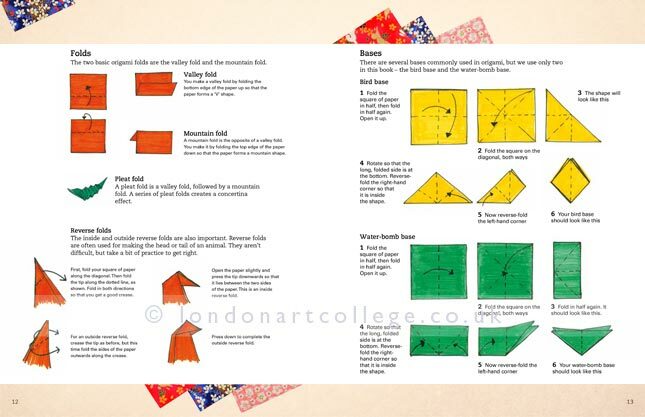 Many of our students know that promoting themselves online can be difficult and so this is a very user friendly and easy way to show off your artwork. Whether you already have a website or social media..this is another added way of being found. All students need to do is register at this link Painters Online Registration and everything is managed from ‘My Account’. To share in the gallery you need to be registered and logged in. So from ‘My Account’ you go to ‘My Art’ and follow the instructions to upload. The first time you upload you need to name a ‘Gallery’ after this all galleries will feature in the dropdown menu. Many artists have just one gallery, others choose to have several – sorted by medium or subject matter. Then it’s just a case of adding the title, writing a description (include the medium if possible – other artists like to know! ), select the file, tick any relevant boxes about techniques, medium etc and save at the bottom. The galleries are completely managed by yourself and other users can comment on your artwork and contact you from your profile page. This might be very handy if you are looking to gain commission work, exhibit in galleries, or looking for publishers as you can be contacted easily. 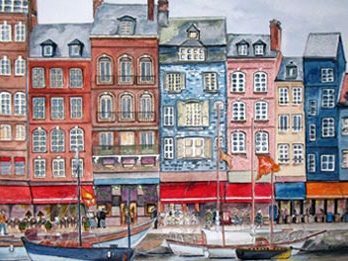 Each artist has a personalised url which can be shared with others, used for publicity and sent to galleries or publishers for your work to be browsed. Web addresses can be added and an artist profile/biography can also be included via ‘My Account’. 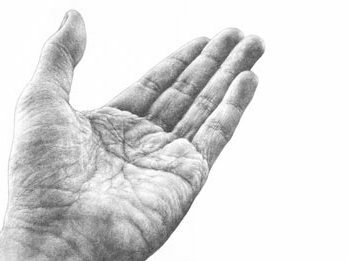 Painters Online also have an area for writing blogs and an active art discussion forum. Alan Bickley is a very active member so our students might want to take a look at his page for inspiration. Alan Bickley Gallery. Also, so that I can help students if they require, I have set up an account for my own drawings which you can find here – Red Kite Studios. I managed to register, write a short bio and upload some of my own artwork within 15 minutes. I found everything very easy to understand, so hopefully you all will too. 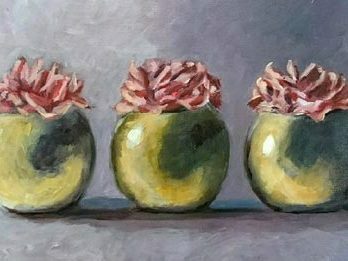 Painters Online also select work from the galleries to share on social media and on e-newsletters – with some artists writing demonstrations and sharing a bit more about how they work. Plus both magazine editors select work to appear in the magazines each month – some have even been asked to write for the magazines! How fabulous is that. You could have your work published just by having a gallery! So what are you waiting for! Go and get started today. Sign up and let us know your gallery address. 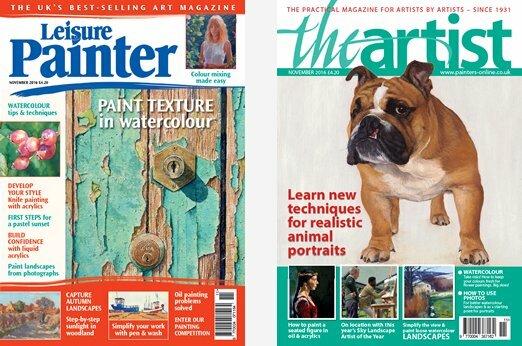 We will promote it here on the blog and our social media…and I’m sure Painters Online will too! Each year the college staff and tutors get together for an annual conference in Bristol UK. This year was a good turnout, with only three tutors who were unable to attend. We had a superb meeting which was very enjoyable and productive. We also had a group photo taken as you can see below. 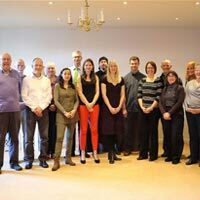 From left to right the tutors and admin staff are as follows – Rupert Douglas Jones, Alison Douglas Jones, Maggy Roberts, Stewart Roberts, Jem Bowden, Monika Cilmi, Melanie Phillips, John Byrne, Rona Cox, Spencer Hill, Alan Dedman and Paul Weaver. Sadly Vanessa Weaver, Shevaun Doherty and Gayle Mason were unable to attend and were very much missed. All of the tutors and admin staff who attended this years annual conference had the difficult task of choosing a winner and runner up out of the finalists that had been voted for and selected by all tutors a week prior to the conference. All of the pieces of artwork were viewed on a giant projector and discussed in depth during the meeting. 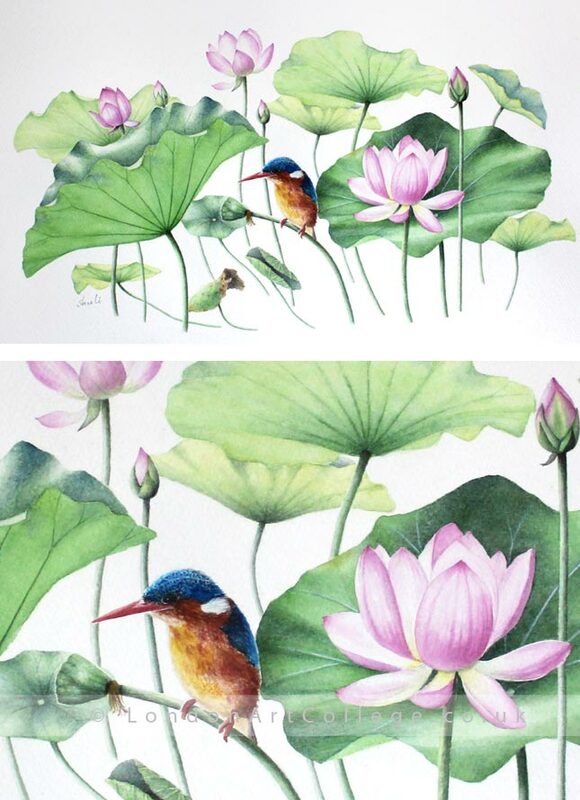 Congratulations to London Art College’s 2016 Competition winner – Shuli Han Dulley who is studying on our Watercolour Diploma course who won with her superb painting called: ‘Kingfisher and lilypads’. 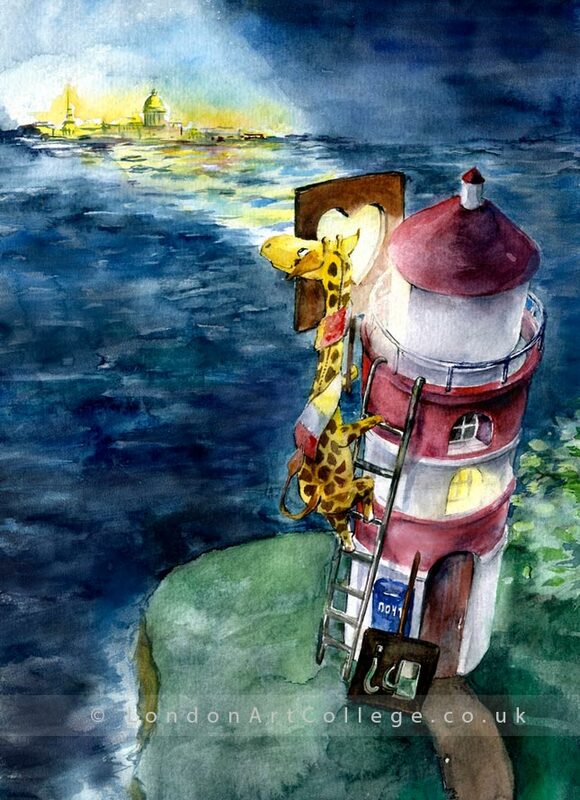 Also congratulations to runner up Natalia Romankova, a student on the Illustrating Children’s Books course with her: ‘Giraffe and Lighthouse’. You can see all of the entries, finalists and winners on our competitions page on our website. 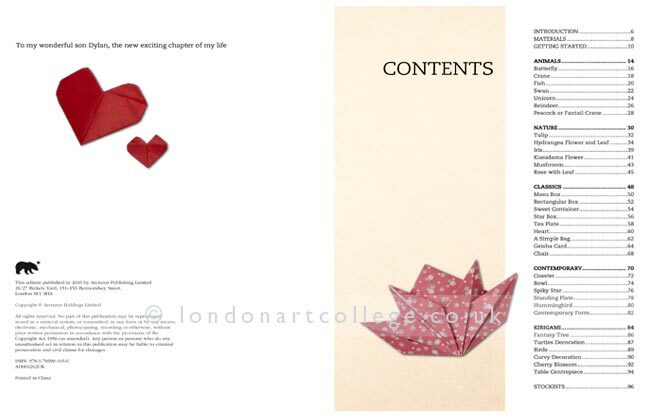 We would like to officially thank all of our students for entering into this years London Art College 2016 competition. It was a very difficult task not only to choose the finalists from the amazing entires but also to choose our winner and runner up. Many of the finalists came very close and we would like to mention Mokhtar Ibrahim with his ‘Carpet Seller’ painting who came a close third. 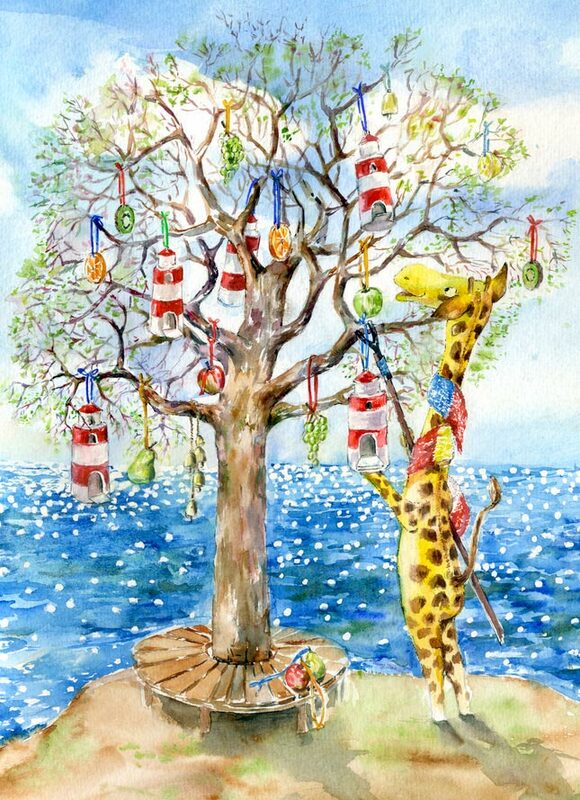 So without further ado, the winner for this years competition is – Shuli Han Dulley for her ‘Kingfisher and Lilipad’ watercolour painting. Shuli will shortly be receiving £200 of Amazon Vouchers. 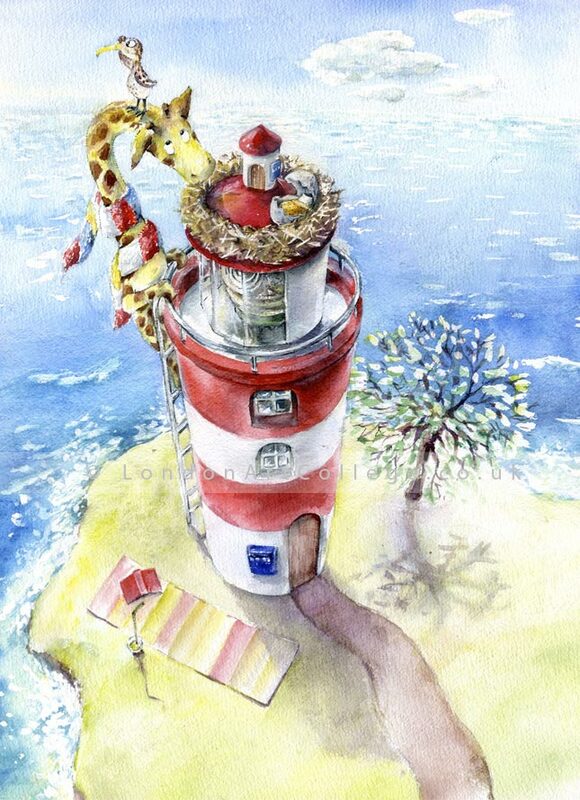 The runner up with her wonderful children’s illustration painting called ‘Giraffe and Lighthouse’ is Natalia Romankova who will be receiving £100 of Amazon Vouchers. 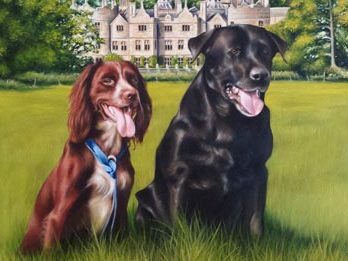 In the next few days we will have a blog post written by each of the winners so do stay tuned to find out more about each of these fabulous paintings. Again thank you to all of our students who entered. 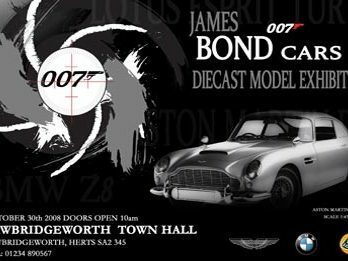 Everyone can now start planning what they will be entering for next years competition…..